The Mypaint main developper Andrew Chadwick maintains a ppa. This ppa provides fresh versions of Mypaint for Linux Mint 17.3 , Ubuntu 14.04 LTS ( and Ubuntu-testing 15.10 ) and Elementary Freya 0.3 users. To install Mypaint via this ppa, copy the code lines one by one ( Ctrl + C in your browser ) and paste them one by one in a terminal windows ( Ctrl + Shift + V ) then press enter. License: CC-BY David Revoy, www.davidrevoy.com, 13 february 2016 . Hey David, thats good news, but I'm on fedora now :( theres no way I can install this using other commands rather than apt? Merci pour l'info Deevad !!! Je cherchait un ppa a jour merci!! Merci Deevad pour cette info, je vais tester ça (pour scratchpad, je pense que je comprendrai mieux en l'utilisant). Tu es toujours sur la brèche question bleeding versions, et tu trouves encore le temps d'avoir une production graphique de qualité... Impressionnant. I know this isn't the place to ask probably - please kindly consider that I am artist that is completely not into all that technical stuff - linux with its many distributions, compilations - gives me shivers lol. Any ideas when new version of MyPaint will show up for Windows? I am DAILY checking their website but there is virtually no new information. I wish everybody would be that informative as Blender devs.. Appreciate answer. @Nezumi : Truely , I have no idea about Windows build ; I even don't know who is the volonteer who packed Mypaint for Windows the first times, and if he would continue it. I guess when a official Mypaint 1.0 will be released , the packagers will convert this version. @Tepee : Merci Tepee :) Ca me prends beaucoup de temps toutes ces installations en plus de faire tourner mon activité freelance. Ca me fait plaisir de voir que c'est remarqué. Merci. @nack972 : Cool :) Pour la doc d'ubuntu , à toi l'honneur ;) Sinon de passage je regarderais au wiki. @flem : Oui, très bonne et très simple pour les utilisateurs d'Ubuntu. J'aime beaucoup aussi suivre le développement de soft en ppa. How come you've got your panels docked on the sides?!?! I don't see such an option anywhere D: And I'm on the latest version, on Windows. Perhaps I should try the linux version. This is from the latest build so, afaik, it is not so much about platform but rather that in Linux is just easier to get it (ppa, easy way to pull git, etc...). I'm sure it can be had in windows, but one would need to compile it. And I know squat about that. Great work! Much better in use. This is great. I will try this ASAP/ Thank you Andrew. @Ashi : This version 'Ocelot' of Ubuntu is not released yet ; so still in beta testing , right ? fyi ...I just posted on MyPaint 1.0 and gave a link back to you. The commands for Linux is very helpful. I really like the new features in MyPaint. @Steven Powers (SMP) : cool :) Good blog btw , I liked the video tutorial about perspective line with Gimp. Thanks David. I personally learn more from watching how something is done and it looks like most people do as well, with all the video tutorials out there. I glad to see a Windows build for MyPaint 1.0 available since I don't compile my own builds. bonjour, est ce que ça veux dire que je ne pas besoin de supprimer mon ancienne version pour lancer la nouvelle (sur ubuntu) ? I just moved up from Mint 11 to 12, got its such a foresaken disaster O_o Good thing Mate exists, else I wouldn't know what to do. 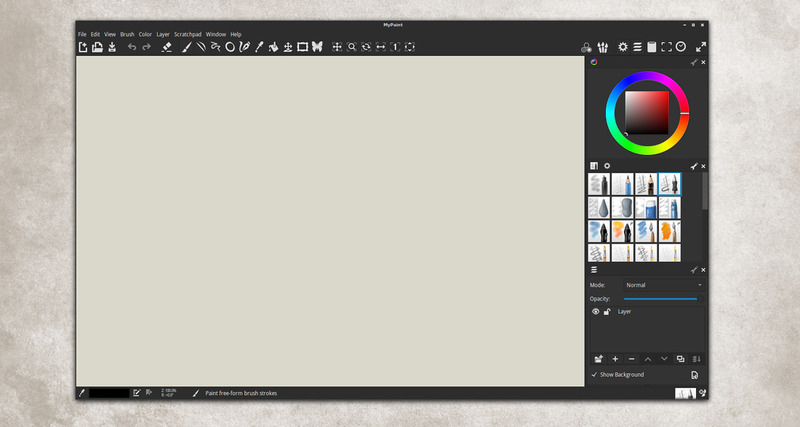 You can try new MyPaint online without installing at https://www.rollapp.com/app/mypaint (registration is required). If there is no build for your system yet, this is a great option. For the moment I've just built the 1.1 from Saucy for Precise and Quantal, mostly for my own use. Other people stuck on 12.04 may find it useful. @Shnatsel : Hey Shnatsel, this is a very good news. I'm planning to centralise a page on my 'tutorial' with all useful ppa. I'll add your. I'll note it on my to-do , I hope I can make it next month. Thanks ! Ho good new about Mypaint project! it is Alive !! FYI...There is also a Windows build for MyPaint 1.2 which I have been playing with for a couple of weeks. It is very light weight ir regards to resources and I haven't had any crashes at all. The features I very nice. I am planning to install openSUSE Linux. Will Mypaint project work on that? I cannot say ; I didn't tested. I guess it depends of the version of OpenSuse, the tablet hardware you have and what you want to install as a desktop environment. Good luck! Merci! En effect. C'est mis à jour à présent.